Brain Targeted Drug Delivery Systems: A Focus on Nanotechnology and Nanoparticulates provides a guide on nanoparticulates to both academic and industry researchers. 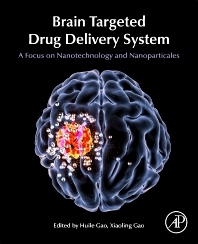 The book discusses key points in the development of brain targeted drug delivery, summarizes available strategies, and considers the main problems and pitfalls evidenced in current studies on brain targeted drug delivery systems. As the brain is the most important organ in the human body, and disorders of the central nervous system (CNS) are the most serious threat to human life, this book highlights advances and new research in drug delivery methods to the brain. Dr. Huile Gao received his PhD in Pharmaceutics from School of Pharmacy, Fudan University in 2013 under the supervision of Prof. Xinguo Jiang. Then he joined the West China School of Pharmacy, Sichuan University as an Instructor in July 2013 and was promoted to an Associate Professor in July 2014. Dr. Gao’s research interests focus on the design, synthesis, characterization and evaluation of stimuli responsive nanomaterials for drug and imaging probe delivery to improve treatment and diagnosis of human diseases especially tumor and brain diseases. He has published over 50 peer-reviewed articles. His research is supported by National Natural Science Foundation of China (81373337, 81402866), Excellent young scientist foundation of Sichuan University (2015SCU04A14) and 4 other grants. His doctorial dissertation has been awarded as Excellent Doctorial Dissertation of Shanghai in 2015. He was awarded as “Young Excellent Pharmaceutics Scientist” in 2015. Xiaoling Gao is a Professor at Department of Pharmacology and Chemical Biology, Shanghai Jiaotong University School of Medicine. Her research has been focused on developing novel nanomedicines and nanoparticulate drug delivery systems for the management of brain diseases, especially Alzheimer’s disease and glioma. She has authored or co-authored more than 50 papers in peer-reviewed journals, which have been cited more than 1500 times. Her work has been highlighted in ACS Nano Perspective and reported by Chemical and Engineering News. She received the nomination award of China Top 100 Excellent Doctoral Dissertations in 2009, and won the 2nd prize for Progress in Science and Technology awarded by Chinese Pharmaceutical Association in 2010. As a main contributor, she also won the 1st Prize for Progress in Science and the 1st Prize for Progress in Technology, awarded by the Chinese Ministry of Education. In 2017, she won the Excellent Youth Award from the National Natural Science Foundation, and was enrolled in National Youth Talent Support Program.